As we always tell our couples, each wedding is unique and different. Although the backbones of the day are traditionally the same, each wedding offers it’s own special traits and schedule. Vince and Krista’s Southern Maryland wedding was the perfect example! We always try to accommodate the best situation for our couples to make sure that they get the MOST out of the collection that they choose. Vince and Krista had the perfect unique situation! They decided that they were going to have a Jamaican ceremony, but wanted their closest friends and family to be there when they REALLY got married. So they had a small, intimate ceremony at the Calvert County courthouse before they headed off to the land of salt water and sun to enjoy a private island ceremony followed by a relaxing honeymoon! The best part – they had a huge party waiting for them when they got back from their trip! 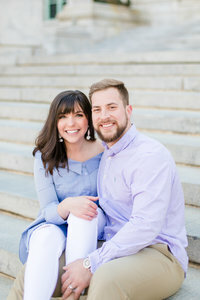 Instead of having an engagement session, Krista and Vince asked us to use their engagement session time as coverage for their ceremony at the courthouse. It was such a beautiful day and their families are honestly the most kind people that we could have ever asked for! They were so funny and sweet – it felt like we had known them for years! Then when they got back from Jamaica, we were there to photograph their amazing reception at their family’s private residence! Here are our favorites from the courthouse ceremony! And now for the party! Just look at the way that Krista’s face lights up when she sees Vince. It’s the sweetest thing! When we had asked Krista what her favorite thing about Vince was, she said, “I love Vince’s smile, sense of humor, the way he makes me laugh. I love how hardworking he is…his strength, loyalty… I could go on and on!” How sweet?! And although they have been together for over SEVEN YEARS, they have NEVER had their portraits taken professionally! So that means that we were the very first ones to take their portraits! What an honor! And for it to be on their wedding day and celebration at that?? We were certainly excited! And get this – there was a RAINBOW DURING SUNSET PORTRAITS. How special is it that we got a rainbow, but to get a rainbow at sunset?? It was so beautiful!!! A huge thank you to the following vendors who made this stunning Southern Maryland wedding come to life! We love backyard, intimate family weddings! If you want to see more, go to Justin & Lisa’s La Plata Wedding! « Lasik Surgery! I Can See!